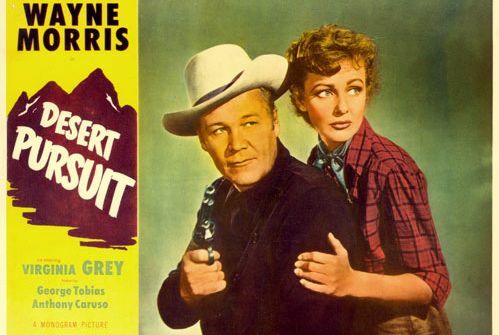 Wayne Morris and Virginia Grey star in DESERT PURSUIT (1952), just released on DVD by the Warner Archive. 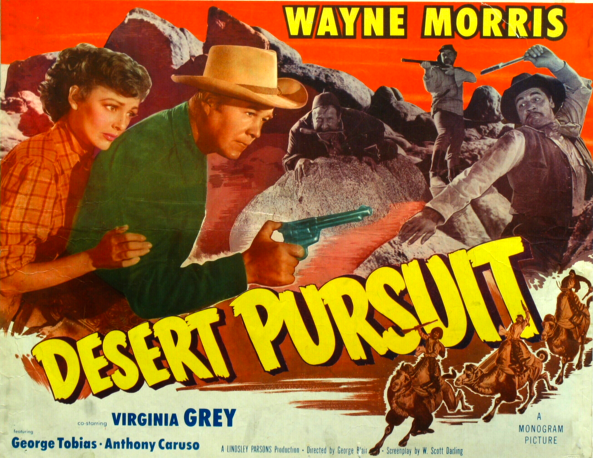 DESERT PURSUIT was filmed the year before Morris and Grey costarred in THE FIGHTING LAWMAN (1953), and it's much the better of the two films. Morris plays Ford Smith, a successful gold prospector headed toward San Bernardino, where he plans to cash in his gold and buy a ranch. He's accompanied by Mary Smith (Grey), a former blackjack dealer from Carson City who had stumbled into Ford's camp on her way home to San Bernardino. Unfortunately three "bad men from Bodie" are on Smith's trail, as his friend (Emmett Lynn) blabbed about the gold when he was drinking. The trio of bad guys (George Tobias, Anthony Caruso, and John Doucette) hoping to steal the gold have an advantage over Ford and Mary as they travel through the desert -- they're riding camels! Ford and Mary manage to protect the gold while fending off the bad men. Matters come to a head when Ford and Mary stumble into an Indian camp on Christmas Eve; the Christian Indians are stunned by the "three wise men" who show up on their camels shortly thereafter. This was a pleasant little Western, especially if you're not expecting much going in. There's some nice chemistry between Morris and Grey. Having known Ford's sweetheart back in San Bernardino, Mary has to break the news to him that the girl married someone else, but Ford's not sad for long, with someone like Mary around. They're cute together joking about her being his squaw when they're in the Indian camp. 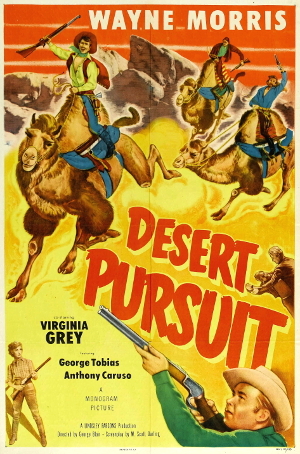 DESERT PURSUIT was directed by George Blair. The script of this 71-minute film was by Scott Darling, from a novel by Kenneth Perkins. The camel theme was familiar to me from an early MAVERICK episode, "Relic of Fort Tejon" (1957). I checked and sure enough, the MAVERICK episode was also based on a story by Kenneth Perkins. He must have specialized in writing about camels in the Old West! 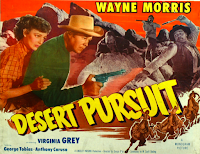 DESERT PURSUIT was one of a quartet of Wayne Morris films released this month by the Warner Archive. Last weekend I reviewed Morris in ARCTIC FLIGHT (1952). Coming soon, reviews of Morris in two more Westerns, SIERRA PASSAGE (1950) and THE DESPERADO (1954). 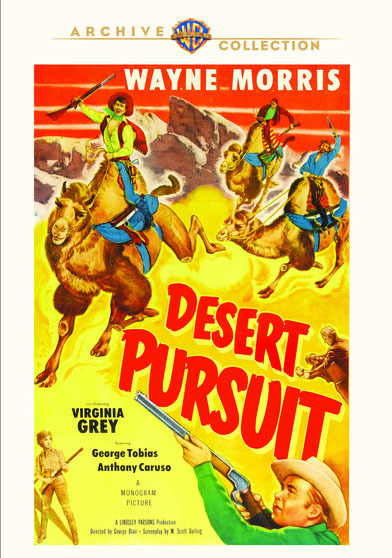 The Warner Archive has presented DESERT PURSUIT in a lovely print. There are no extras. Ha, My Wayne Morris quartet arrived this morning and I cannot wait to dive into 'em. to approach the film totally fresh,though I loved the Virginia Grey quote. I will compare notes Monday when I've seen the film. the graphics on the discs themselves-very appealing. There are no trailers and THE DESPERADO looks sensational in widescreen. fight his corner apart from Mark at Where Danger Lives who rates him rather highly. films I have never seen. B Series Western and Blake makes a very interesting point if this really is the case. make these releases very appealing. Glad your Wayne Morris films have arrived now, John - a happy bunny once more! I only know George Blair as director of three of Rex Allen's earliest, and best, series westerns though he had a pretty busy career subsequently on TV. Re, John's comment about an earlier comment I made, it wasn't about the whole series of Wayne Morris Westerns, only about the next to last THE DESPERADO which I saw theatrically when it came out and would not have been something I would have felt to be a series Western, even if I wasn't thinking about this kind of thing back then--but I have seen it again since as well as the AA remake in 'Scope and color, COLE YOUNGER, GUNFIGHTER and just feels like a B movie/programmer, as John says, not so different except for black and white than Universal color ones--McCrea, Murphy, Calhoun or Mahoney always played in serious Westerns of individual character--not even remotely my idea of series pictures--and the stars play complex characters who are all different. I guess my idea of a series Western is where the star always plays some variation of the same role. that reputation as the last series Western have long had it on my list so will see if it plays that way for me, but I'm guessing that it won't. Somehow I believe in a real way those days were over. And it's not that series Westerns could not have a lot going for them. Tim Holt was terrific and those are quality movies, just to name the obvious example--but they do seem cut to a pattern in comparison to most 50s Westerns. Laura has not been overwhelmed by the talent of Wayne Morris. Though it's not a deep argument for me when she says that he's "uncharismatic" personally I like him as an actor, feel he can hold his own including as a lead in Westerns. He doesn't cut out a deep place in cinema I guess, but sadly, he was pretty young when he died. John, that's great your Morris films arrived! I'm looking forward to your feedback. I'll be reviewing THE DESPERADO and SIERRA PASSAGE in the coming weeks. Lots of Wayne Morris here right now! Just read a review of WOMEN FROM HEADQUARTERS by Mark at Where Danger Lives and I'm intrigued. Jerry, I checked and I see that I have a couple of the Rex Allen films directed by George Blair. Thanks for the tip. Blake, always good to hear from you, thanks for sharing your thoughts on the Morris films. Looking forward to trying out more soon. move at an incredibly fast clip. while coping with demanding day jobs...."Superwomen" indeed! caution to the wind and braving the wrath of Toby's posse. I might add that I loved DESERT PASSAGE and ARCTIC FLIGHT. Laura, did I not send you WOMEN FROM HEADQUARTERS ? I love films about female cops...more of that later. Universal.Audie was paid a mere $10,000 which obviously rose as his star did. Why oh why has Universal not given this film a domestic release. getting Universal Vault releases on a WEEKLY basis. and Scott Brady getting the goods on a big scale drugs syndicate. Mob" are not as easy to fool as in similar films. release would be most desirable. Now I'm off to Toby's...I'm wearing my flak jacket! Just visited 50 Westerns From the 50s, and anyone who would like to read your initial comments on the Wayne Morris Warner Archive releases can find them here. It's interesting trying to balance covering everything I'd like to share with my readers -- and having a lively blog which encourages frequent return visits for new posts -- with a more leisurely pace which seems to encourage longer conversations on some posts. I've looked at alternatives such as the "newspaper front" page (such as at my friend Aurora's blog) with short snips of many posts visible simultaneously but there are drawbacks there too. In any event it's most enjoyable when the conversations grow -- Buck Jones got up to 20 comments so far! In any event, it's a joy for me to have this site to share our enjoyment of "fun stuff"! It's funny, John, WOMEN FROM HEADQUARTERS didn't sound familiar but your comment just prompted me to check and I do indeed have it thanks to you, yay! Have to bump that one up in the viewing, although Mark wasn't a big fan the plot intrigues me. UNDERCOVER GIRL sounds fun too. Have you seen Marsha Hunt in MARY RYAN, DETECTIVE? I find the "police woman" films of that era interesting. fan I'm pretty sure that he will have it. track down some more Joseph Newman "Noir" Caught up with 711 OCEAN DRIVE...Loved it! a producer who never pressured anyone...very interesting. I have met Budd,he was fine with me I might add,no sign of ego. Lyn has some great B Movie creds...lost of Regalscope titles. John, I think you and your friend will enjoy MARY RYAN! It's out on DVD from Sony if he doesn't have it already. I happened to see it with Marsha Hunt in attendance and afterwards she joked "Mary Ryan could do anything!" So glad that ABANDONED led you to even more...I absolutely loved 711 OCEAN DRIVE. Sometimes I don't like the plotlines where the guy makes dumb choices but I thought it had such a compelling romantic streak running through it, plus fantastic location shooting in places like Gilmore Stadium, Palm Springs, and the Hoover Dam. Very interesting feedback on Lyn Thomas! Thanks for sharing that! P.S. Don't usually do it but I put in links to some relevant old posts in this comment in case you'd like to check any of them out.